For all their alien/underwater/superhuman evildoers, says Lewis, comics have on occasion borrowed villains from the real world—the Image cover updated one from World War II showing Captain America slugging Hitler. 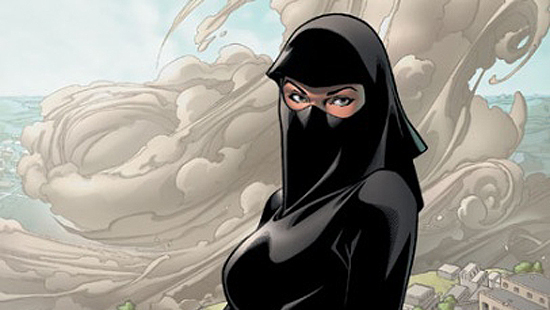 The year after 9/11, Marvel Comics introduced Dust, a Muslim “mutant” (superhuman) member of the famed X-Men, only her eyes visible beneath her niqab. Born in Afghanistan, she can change into a blinding, skin-shredding sandstorm. Then there’s M, whose super strength, telepathy, and flight are the least obvious of her attributes (buxom and curvaceous, she’d shame Wonder Woman as an adolescent boy’s fantasy). M debuted in 1994. She revealed this year that she’s Muslim. Meanwhile, rival publisher DC Comics recently brought out Nightrunner, an Algerian Muslim immigrant recruited by Batman, drawing charges from some American readers that DC is PC. Batman, they groused, should have deputized a native Frenchman. For much of the Cold War, Lewis says, mainstream comics avoided religion and tended to use communists when they needed real-life villains. Then the 1973 Arab oil embargo and the 1979–1981 Iranian hostage crisis turned the comics’ gaze toward the Middle East, and the Hulk embarked on global adventures that included evil Arabs. But if that’s your scenario, Lewis says, you “do also have to opt for at least the token opposite…a token superhero,” and in 1980, the Hulk series introduced the Arabian Knight, “our first headlining, Middle Eastern superhero,” replete with a flying carpet and a scimitar that fired force beams and could pierce anything. He lasted about five years. The comics’ interest in Arab characters receded along with the price of oil in the late ’80s and the shift in national angst towards the rising economic sun of Japan. Then came 9/11. While American interest in Islam led to Muslim heroes, Muslim villains (fictional ones, anyway) have been rare, which Lewis attributes in part to publishers “playing it safe,” not wanting to muck with either Islamophobia or offending potential customers. Frank Miller, creator of the Batman Dark Knight series, announced in 2006 that he was writing a graphic novel pitting the Caped Crusader against bin Laden. He later announced that he’d substituted a new superhero in the book, which he targeted for publication this year. It’s unclear how he’ll proceed in the wake of bin Laden’s death. Read the full article here. Also see this slideshow of Muslim superheroes. It has been fun in Doha.. However, after back-to-back conferences, I'm ready to go back home. This was my first time in both Dubai and Doha, and I know that this is summer. But - it's hot here! It is like a hair dryer running all the time! I was under the impression that the heat would subside soon after the sunset. Not so the case in these cities. I guess, unlike the desert sand, the concrete of the cities keep a good fraction of the nights warm. So while I travel back, here is 'Saudis with Audis' for your entertainment purposes (tip Tabsir.net). Heck it even has a Doug Floutie reference. In the mean time, Saudi Arabia is trying to keep things surreal. In the second decade of the 21st century women still can't drive in the Kingdom. Just yesterday, the police detained 5 women for driving! Mind you, this is not even about equal rights - those fights are still a ways off. This is about the right to drive. Then it will be about the right to leave the country without the permission of the husband, and then perhaps, we will get to voting rights. All of this makes me even more furious about one of the participant at the Belief in Dialogue conference, who not only defended the theocracy in Saudi Arabia, but also sang its praises (see the brief mention in this post). Sometimes Saudi Arabia seems like a place from a parallel universe in a bad sci-fi novel. The conference titled ‘Belief in Dialogue: Science, Culture, and Modernity’, that was organized in Sharjah by the British Council (BC) and the American University of Sharjah (AUS), in collaboration with the International Society for Science and Religion, ended this past Thursday. Judging from various feedbacks, it was a resounding success. Let me offer a few personal highlights, which are necessarily subjective, especially since, constantly running around to take care or supervise one thing or another, I had to miss a number of talks. After months of preparation, we the organizers were almost there; the day before the opening, a press conference was held. Half a dozen or so reporters showed up to hear about the event and to ask questions to the panel, which included Paul Davies, William Grassie, Salman Hameed, and myself, in addition to officials representing AUS and BC. I was pleasantly surprised to see the reporters immediately dive into the issues, asking to what extent the topics were going to be controversial, whether that posed any risks, and whether the conference was going to address socio-political questions (funding of Science in the Arab-Muslim world, the Arabization of science education, the effect of the Arab Spring on the status and future of Science in the region, etc.). That gave everyone a taste of the discussions that were going to take place during the next three days. The great thing was that almost everyone was able to come, including Prof. Ihsanoglu, the Secretary General of the Organization of the Islamic Conference and a renowned historian of science, who gave the keynote address on the first day and with whom a few of us had the pleasure of holding very interesting long informal discussions afterwards. The one big exception was Tariq Ramadan who could not come but got his talk video-recorded and showed in the session he was scheduled to speak in (second day). Salman has given a brief account of the strong exchanges which occurred in that session: Zia Sardar provocatively criticized various people (without naming them), Aref Nayed took strong exception to Sardar’s opinions, etc. I should also point out that the session included William Grassie who gave a great talk on ‘Big History’ and the need to adopt it into our curricula, and Philip Clayton, who gave a poignant lecture on how consumerism, individualism, and the “latest-technology” trend are destroying tradition and religion(s), not Science. In a way, the Sardar-Nayed clash resembled the famous exchange which took place 25 years ago between Sardar and S.H. Nasr, which now has taken a mythic status. For the record, I would like to add that upon the request of Ehsan Masood, I got Aref Nayed to come back the next day (he is based in Dubai and only attended a few sessions) and have a open chat with Zia Sardar; the two intellectuals immediately turned very friendly and mutually understanding toward one another, and after 30 minutes, they were inviting each other to future events (Dr. Nayed said he much prefers small-group meetings). As divine providence would have it, that discussion ended just as I was supposed to head to the closing student seminar, and Zia and Aref kindly agreed to join me there, along with Bruno Guiderdoni and Philip Clayton, who were already scheduled to conduct the closing discussion with the students. I should note that in addition to the scholarly conference, a student seminar was organized as part of the event. 25 students were carefully selected (on the basis of their academic credentials and backgrounds), so that half of them were from AUS and half were from the rest of the world (from India to Brazil, including Jordan, Morocco, and the UK); they attended all the plenary sessions, but instead of the parallel sessions, they attended a special program. Everyone who had discussions with the students (including Clayton, Sardar, Masood, and Patricia Fara) came away amazed by the students’ level of education and critical thinking abilities. The student seminar closing session was itself a model of rich discussions, and many participants have now written to us to thank us for the great opportunity. The conference ended on Thursday and I'm currently in transit to go to Doha. The conference was a thoroughly enjoyable experience and it was fun hanging out with the participants. It was good to see some old friends, some whom I already through e-mail, and to make some new friends. I guess we can say that for most conference. In fact, that is the reason we go to conferences. The conference ran very smoothly and we were very well taken care off. The credit here goes to Nidhal and the AUS, and Fern and the British Council. Well Done! The last day of the conference was bit of a mix-bag. The morning plenary session was a reprise of the opening plenary session titles, Science & Religion: Two Cultures? (see the post for Day 1 here). However, unlike the earlier session, the talks in this session were not as good with the big exception of Edward Larson. Larson talked about beliefs of American scientists. He is the author of one of the major studies in this regard in 1998 that found that close to 90% of elite scientists (members of the National Academy of Sciences) are agnostics/atheists, compared to 60% of the middle-of-the-road scientists. The numbers for the latter set have not changed dramatically from two earlier studies in 1914 and 1933, but the numbers of believers have gone down amongst the elite scientists from 1/3 in 1913 less than 1/10 in 1998. All of this is dramatic when compared to the general American population, where the number of believers hovers around 85% (there are some other competing numbers, but usually agnostics/atheists are around 15%). These trends amongst scientists have also been confirmed by a recent study by Elaine Ecklund, who found 2/3 of scientists either agnostics or atheists (though she also introduces a not-so-clear category of spiritual scientists, and her scientists include economists and sociologists as well. I had a nice chat with Larson about Ecklund's book over dinner, and he agrees with her numbers but not necessarily with all her interpretations). So what do scientists themselves say about their reason for disbelief. According to Larson, the problem of evil is at the top of the reason, followed by skepticism towards supernaturalism. And he found that the Galileo trial - with many of the misconceptions - shapes the science & religion narrative for many of the scientists. Furthermore, all of this gets inflamed when you add creation debates and politically charged stem cells controversy. None of this stuff was new, but Larson did a fantastic job of distilling all of the key issues together. Then there were couple of odd talks in the session. One was by Noman ul Haq who declared that there is and has never been any conflict between science and Islam. He contrasted this with Christianity. This is a sweeping generalization, and a surprising one coming from a historian. He mentioned couple of Muslim scholars from the medieval times who were also workers for the mosque or theologians. Well, sure, but that was the case in Christianity as well. The categorization of both "science" and "religion" is a relatively recent phenomenon, and most scholars thinking about the natural world happened to be philosophers and theologians. This was not exceptional to Islam. Second, the relation between science & religion even today is complex. Yes, at some places there is conflict (see creationists like Zakir Naik, Harun Yahya, and others like Maududi, etc), and at others its not. Noman not only made this generalized assertion, but did so in the presence of the guy who has written one of the most sophisticated works of science & religion interaction, John Hedley Brooke (John was the session chair). Perhaps, more troubling was the fact that he gave the impression that Copernicus copied his idea from al-Tusi. While part of this is true (there is good evidence that Copernicus used a figure by al-Tusi), it is important to stress that neither al-Shatir or al-Tusi removed the earth from the center - the key step in the move away from geocentrism. Now it is quite possible that we may discover documents later that some Muslim scholars had taken that step too. But as far as I know, there is no evidence for that. I think, this clarification is important to make (also see the lecture by George Saliba on this topic). The post is getting long, so I will add some more things later. But overall, the conference was a great experience. Some of the talks were absolutely fantastic. There was one by Rana Dajani on stem cells ethics that was great! I also have a short video of her that I will post in a day or two (along with some pictures of some of the friends attending the conference). I did not attend the parallel student sessions. Those were apparently a phenomenal success - and to be honest, that is what matters most. There was also a very productive and interesting session with the media. More on that some other time. Millions of individuals in the UK believe in UFOs and ghosts. Yet we know that there is no credible evidence for any visitation from outer space or for some dead souls hanging out in abandoned houses. On the other hand, there is now overwhelming evidence that humans and other species on the planet have evolved over the past 4.5bn years. And yet 17% of the British population and 40% of Americans reject evolution. It seems that for many there is no connection between belief and evidence. Some – maybe most – of the blame can be attributed to an education system that does not train people to think critically. Similarly, most people do not understand methodologies of science and the way theories get accepted. For some, scientific evidence has no role in the way they envision the world. People who claim to have been abducted by aliens provide an interesting example. The "abductions" happen mostly in the early morning hours and, apart from psychological trauma, there is no physical evidence left behind. Some scientists have attributed these episodes to sleep paralysis – a momentary miscommunication between the brain and the body, just before going to sleep or waking up. While abductions have most likely not taken place, the trauma experienced by the individuals may still be real. Some abductees have shown signs of post-traumatic stress disorder, and many cite this as the worst experience of their life. However, for many, "abduction" was the best thing that ever happened to them. This is a life-changing event for the abductees. They feel a sense of uniqueness. Abduction may have been painful, but they were the ones who were picked. While the public mocks claims of alien abductions, many abductees join support groups that include others who share similar experiences. For the abductees, evidence is irrelevant. They know it happened. They experienced it. These abductions form their whole worldview and provide an explanation for the occasional paralysis at night, a sense of uniqueness and meaning in life, and a community of like-minded individuals. I can't help but think of evolution debates taking place across the world. I have been interviewing physicians and medical students in the Muslim world, and have seen a wide range of responses. Many have no problem with biological evolution, whereas others reject it vociferously. The reasons for rejection are often religious, but then justified with misinformed ideas about evolution ("where are the missing links? ", "evolution is just a theory"). For a subset of interviewees, evidence (or lack thereof) plays no role in their rejection of evolution. In their minds, an acceptance of biological evolution will lead to the abandonment of their religion. The cost of accepting evolution may simply be too high for them. I don't want to give the impression that we should just shrug our shoulders and give up on critical thinking. But we have to realise there will always be individuals who reject evolution for reasons that have little to do with evolution. If certain beliefs are bound up with personal meaning-making, then an attack on those beliefs threatens what is meaningful for that person. An effort to move them towards more evidence-based thinking may need to untangle meaning-making from such beliefs. Even if our efforts are unsuccessful with these individuals, a deeper appreciation, understanding and sympathy for their beliefs may be essential in communicating better science. Read the article and comments on the Guardian website. Saturday Video: "Is there an edge to the universe?" Here is a call for submission for a new book, South Asia Across the Disciplines. It will be published jointly by the University of California, University of Chicago, and Columbia press as the first of the series of books. Not a too shabby list of publishers. With support from the Andrew W. Mellon Foundation, three of the academy’s leading publishers in South Asian studies have combined their resources to launch a major new series devoted to first books in this vibrant area of scholarship. “South Asia Across the Disciplines” publishes work that aims to raise innovative questions in the field. These include the relationship between South Asian studies and the disciplines; the conversation between past and present in South Asia; the history and nature of modernity, especially in relation to cultural change, political transformation, secularism and religion, and globalization. Above all, the series showcases monographs that strive to open up new archives, especially in South Asian languages, and suggest new methods and approaches, while demonstrating that South Asian scholarship can be at once deep in expertise and broad in appeal. We invite manuscripts from art history, history, literary studies, philology or textual studies, philosophy, religion, and the interpretive social sciences, especially those that show an openness to disciplines other than their own. As a collaboration among leading university presses, “South Asia Across the Disciplines” marks a new approach. Each book in the series is published under the imprint of one of the three presses, but all are promoted as part of the series, sharing in design, advertising, and publicity. Sometimes it is good to have a provocateur. The conference really came alive on day 2 when one of the speakers took on to criticize several of the earlier speakers, and to the absence of serious critique of the science-religion dialogue. The provocateur was Ziauddin Sardar from UK. In the 1980s, he was part of a movement of "Islamic Science" that critiqued science from 'science-studies' perspective and wanted to bring in Islamic ethics to the practice of science. His views were criticized from many different quarters, including from scientists. However, at the conference he mentioned that one of the major reasons for him to give up on his ideas was the absence of much scientific culture in the Muslim world. He was dismayed by the fact the "Islamic Science" began to be associated with either I'jaz - the idea that modern science exists in the Qur'an - or that of the mystical version promoted by Seyyed Hossein Nasr. But Sardar was irked by, among other things, a video-talk by Tariq Ramadan (he claimed that cultural contexts of Muslims vary, and that culture and Islam interact in a multi-dimensional way), the inaugural lecture by Ihsanoglu (he had emphasized the Golden Age of Islam), and by some bizarre apologist statements regarding Saudi Arabia by Qanta Ahmed (she lauded the progressive theocracy of Saudi Arabia and some incredible developments in science in the Kingdom - and no - she was not being ironic). So Sardar decided to provoke everyone at the same time. His main point was that Muslims today really don't have a culture. That they been only left with belief (he pointed to Dubai as a one of his examples). Plus, he lamented the fact that philosophy as a subject was excluded in much of the Muslim world until very recently. This looks like a straight-forwad presentation, but it was his particular style that made it quite effective. As expected, that generated some strong reaction. In fact, the first person in the Q&A characterized his talk as a "bitter old man reflecting on his past failures" (Sardar responded that he is not old, "only 60" and that he "has a long ways to go"). Well, at any conference, it is moments like this that loosens up the participants. I think the conference had been going in almost a too deferential style - and this changed the tenor a bit. In fact, I got heckled in the middle of my talk in the very next session. It wasn't too bad, but one of the participants decided to comment on a point during my talk rather than wait for the Q&A. I'm currently attending the Belief in Dialogue: Science, Culture and Modernity conference at the American University of Sharjah (AUS). It has started very well, but Nidhal did not control the weather. It is hot and humid here - and somehow I'm missing the snow of New England. But air conditioning has been working in AUS and the climate is pleasant at the conference. It has also been fantastic to meet some some regular blog readers and other friends coming from other places in the world. Day 1 of the conference was inaugurated by Ekmeleddin Ihsanoglu, who is not only the Secretary-General of the Organization of Islamic Countries (OIC), but is an academic and historian of science. Ok - so he may not be the best animated speaker, he it was good to see some actual history of science in an inaugural session. But I think things picked up with the first plenary session on Science & Religion: Two Cultures? There were three speakers: John Hedley Brooke, Nidhal Guessoum, and Paul Davies. Since I'm sitting at the conference, couple of quick points about this panel. John Brooke, as usual, gave a really interesting talk (he has a wonderfully polite way of speaking) breaking down the simplistic views of science & religion interaction. His talk was actually titled: Science & Religion: How many cultures? His main point was that there have been many different episodes of interactions - and these interactions have all been rooted in particular historical contexts. If you are interested in this topic, you should definitely check out his classic text Science & Religion: Some Historical Perspectives. 2. Add an optional theistic interpretative mantle. Those not theistic can stay naturalistic in their approach to the universe. 4. Accept Qur’an's guidance but also be willing to reassess the interpretation when modern science and Qur’an appears to be in conflict [I think missed the exact wording of the middle of point four. But from what I remember, Nidhal is making a point similar to Ibn-Rushd and Galileo. I hope I got it right as this is an important point]. I think this is a great list and his points 2 and 4, in particular, are essential for Muslims in a pluralistic modern scientific world. More to come on other sessions. In the mean time, the temperature outside better cool down a bit. Four months after Egypt's revolution toppled the authoritarian regime of President Hosni Mubarak, science and education are slowly emerging from the post-revolution chaos as national priorities. Revitalizing Egypt's sclerotic and chronically underfunded research, education and innovation systems will require sweeping reforms and substantial rises in spending. 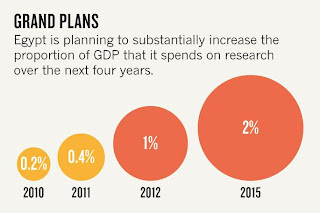 But modest funding increases and a warmer political climate for research and education have left Egyptian scientists feeling more optimistic than ever before. "We are going to build our economy to be based on democracy, and science and technology," says Maged Al-Sherbiny, president of the Academy of Scientific Research and Technology in Cairo and assistant minister for research. On 1 June, the Egyptian cabinet approved the first post-revolution budget, which boosted science despite the severe social and economic crises gripping the country. 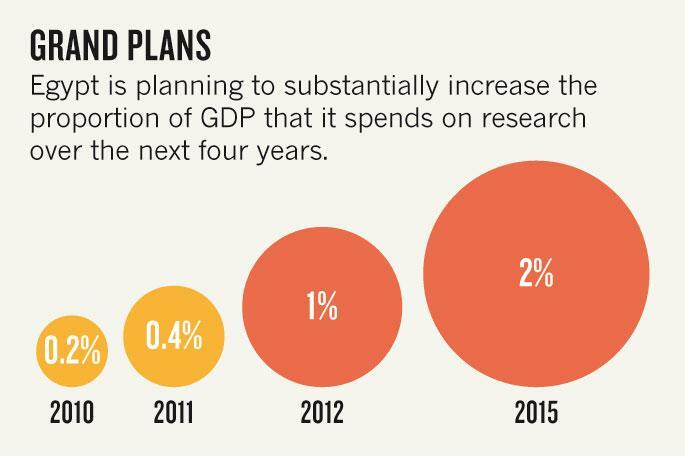 Research spending will rise from E£2.4 billion (US$404 million) to E£3 billion in the 2011–12 financial year. The education budget also jumped, by 16% to E£55.7 billion. This is still only 0.4% of the GDP - much below the recommended investment of 1-2%. But the budget goals are aiming for this level by 2015. We will see if this actually happens or not, and if all of this is used in a productive manner. But at present, it is great to see the public ownership of the process and the optimism of the scientists. Is Science Nearing Its End? Gulf News published an Op-Ed by me this past Friday. They didn’t change the title I had given it: “Is Science nearing its end?” Originally, I wanted to review the recent book by Russell Stannard, “The End of Discovery”, which is subtitled "Are we approaching the boundaries of the knowable?" But Gulf News was not interested, for several reasons, one being that the book is more than 6 months old, and another being that they tend to publish reviews of mainly socio-political books or biographies. So I suggested that I write an Op-Ed commentary on the question of whether scientific knowledge is closing down, arguing that this is an important issue to consider. And indeed, they invited me to write such a piece, which they immediately loved and published the very next Friday (when such Perspectives articles are run), without changing its title, and with almost no modification whatsoever. Interestingly, it seems to have received quite a number of hits, judging by the number of “Like”, “Share”, and even “Tweet”. I will paste the first few paragraphs below. Fifteen years ago, American science writer and commentator John Horgan rocked the scientific community with a book titled The end of Science. In it he argued that while the early 20th century had witnessed major scientific revolutions and paradigm shifts, the past 50 years were sterile. According to him, humans had, for all intents and purposes, uncovered the fundamental laws of nature, and should now only seek good practical applications. A few years before that, American Nobel prizewinning physicist Steven Weinberg published Dreams of a Final Theory, claiming that scientists were nearing the construction of a unified theory of nature — hence that there will soon be little left to find, at least in physics (the most fundamental of sciences). And last October, Russell Stannard, Emeritus professor of the UK's Open University, published The End of Discovery, asking, "Are we approaching the boundaries of the knowable?" So why do such highly intelligent and knowledgeable thinkers believe that science is coming to an end? Are there no more great questions to answer? This is perfect timing. On the eve of the Science, Culture, and Modernity conference in Sharjah, Steve Paulson has an excellent article in the Chronicle of Higher Education: Does Islam Stand Against Science? I think the article does a great job of synthesizing different views and voices on the topic to illuminate some of the complexity associated with the topic. Both of your Irtiqa contributors are quoted in the article, along with our friend Taner Edis, who blogs at Secular Outpost, and several others who are working in this area. Science in Muslim societies already lags far behind the scientific achievements of the West, but what adds a fair amount of contemporary angst is that Islamic civilization was once the unrivaled center of science and philosophy. What's more, Islam's "golden age" flourished while Europe was mired in the Dark Ages. This history raises a troubling question: What caused the decline of science in the Muslim world? Now, a small but emerging group of scholars is taking a new look at the relationship between Islam and science. Many have personal roots in Muslim or Arab cultures. While some are observant Muslims and others are nonbelievers, they share a commitment to speak out—in books, blogs, and public lectures—in defense of science. If they have a common message, it's the conviction that there's no inherent conflict between Islam and science. This is a long article and you can read the full article here. I'm currently at Boston Logan airport to board for Dubai. I will be at two fantastic conferences next week, one in Sharjah and the other one in Doha. The Sharjah conference is organized by Nidhal - and so obviously I'm looking forward to meeting him again. The conference is part of the Belief in Dialogue program launched by the British Council. The theme of this particular conference is Science, Culture, and Modernity, and it is co-sponsored with the American University of Sharjah and The International Society of Science & Religion (ISSR). Nidhal already had a post that described some of the details of the conference. There is a fantastic line-up of speakers both for the plenary and the topical sessions, and this promises to be fun. I will send updates from there. I have a topical presentation on Muslims, Modernity and Science: Lessons from Contemporary Debates over Evolution on Tuesday. I'm also participating in a plenary session on Ethical Values and Human Responsibility on Wednesday, and the title of the talk over there is Should We Bring Back the Neanderthals? Uh-oh - I may now have to come up with an answer before Wednesday. But to be honest, I'm really looking forward to the first plenary session: Science & Religion: Two Cultures? The speakers in the session include John Hedley Brooke, Paul Davies, and Nidhal Guessoum. This should be fantastic! After the Sharjah conference, I'm headed to Doha for The World Conference of Science Journalists 2011.This meeting was originally scheduled for Cairo, but due to the political instability over there, the organizers moved it to Doha, Qatar. This is exciting as it is the first time that the conference is taking place in the Arab world. The line-up of speakers and participants is again spectacular! Just take a look at the program. Apart from the science communication sessions, I'm really curious about sessions that deal with media and science coverage in the Arab and the larger Muslim world. In fact, the opening plenary session on June 27th is titled Unveiling Arab Science. There is perhaps no better time to address this than now. Looking forward to it. I scheduled for the afternoon plenary session on Evolution in the Evolving World of Journalism, organized by Valeria Roman. So yes, the posts have been slow the last couple of days, but I hope to make it up by providing updates from these two fascinating conferences. This is simply beautiful. Here is Andres Segovia, considered as father of Classical Guitar, playing at the Alhambra. This clip is from 1976, when he was 84 years old. Enjoy! In Egypt and Tunisia, ordinary citizens have toppled autocrats; elsewhere in the Arab World, they still battle dictators, armed with little more than their belief in freedom, human rights, and democracy. What sort of society comes after the revolution? Many fear that the idealism of the revolutionary democrats will only pave the way for theological autocrats who preach an intolerant doctrine. But fighting extremism is best done not by censorship or autocracy but by embracing pluralism and defeating ideas with ideas. And here, science has much to say, particularly about the values that are needed for societies to be truly open and democratic, because these are the values of science. Science requires the freedom to enquire, to challenge, to think, to imagine the unimagined. It cannot function within the arbitrary limits of convention, nor can it flourish if it is forced to shy away from challenging the accepted. Science advances by overthrowing an existing paradigm, or at least substantially expanding or modifying it. Thus there is a certain constructive subversiveness built into the scientific enterprise, as a new generation of scientists makes its own contribution. And it is this space that is essential if we want to have growth in scientific fields. The new Arab societies we are building must be open pluralistic societies that are producers of knowledge and new opportunities. Our youth have sparked our revolution, just as other young people have transformed societies, reinvented business enterprise, and redefined our scientific understanding of the world we live in. Today, as they lead the rebuilding of our societies, they must embrace the values of science. Together, all armed with these values, we can think of the unborn, remember the forgotten, give hope to the forlorn, include the excluded, reach out to the unreached, and by our actions from this day onward lay the foundation for better tomorrows. Amir Ahmad, “an avid sociopolitical blogger” since 2006 and “a digital media and marketing consultant”, recently organized “the world’s shortest conference on Islam ever”. This online conference, on the future of Islam in the age of new media, consisted of 60 speakers, some more well-known than others, who each spoke for 1 minute on the topic. The list of participants can be found on the conference’s website, with pictures and very short description of each person. Among the more scholarly names, one finds: Abdullahi An-Na'im (Islamic scholar, Emory University), Reza Aslan (author of No god but God: The Origins, Evolution, and Future of Islam), Mohammed el-Nawawy and Sahar Khamis (co-authors of the book Islam Dot Com). Several reporters and broadcasters also participated, e.g. Brian Whitaker (journalist at The Guardian and blogger on Arab issues) and Ahmed Shihab-Eldin (co-host of The Stream on Al Jazeera English), among others. The whole “conference” can be listened to on audio; there is, as far as I could tell, no transcript available; the audio file needs to be requested by registering oneself on the website. I got the file and listened to it. I had two difficulties with the format: first, most speakers were rushing with their statements, being under pressure to say all they had to say in a minute or less (I myself was surprised at how much one can actually say in 1 minute); secondly, sixty people in a row is a bit too much – indeed, after a few dozen speakers, one starts to lose focus and not really digest the ideas being presented. Nonetheless, there was a variety of interesting thoughts, covering a number of aspects pertaining to the topic. The majority of the speakers spoke enthusiastically about the effects that the new media (blogs, youtube, Facebook, Twitter, etc.) are having on Islam, both as a religion and as a culture. A few of the participants voiced concerns. I’ll try to concisely present those views below. One of the main leitmotivs in the views expressed by the speakers is that the new media are allowing a larger exposure of ideas regarding Islam and giving people new freedoms to express views, whereas the traditional media (of publication and broadcast) used to be sanctioned by the powers-that-be, both political and religious, thus the more “interesting” views were oftentimes hidden from view. Now everything is out there, and there is no moderator. As a result, Muslims are becoming more aware of the diversity within their tradition; they can now shape their opinions in a more informed way, and they can see how much of a spectrum Islam offers. There is also a much greater female participation in the discussions concerning Islam, unprecedented in scale in the history of the Muslim culture. I recently read that in Saudi Arabia, two thirds of social media users are female. Another development that some speakers have stressed is the emergence of a virtual ummah (Muslim nation), new networks and bonds being created between Muslims from around the world, when such direct contacts and exchanges used to be extremely rare, perhaps limited to the Hajj gathering and commercial relations. Some have noted, however, that the democratization of the Islamic opinions described above, can and has turned into a fragmentation, as now we have thousands of views with almost no core, or at least no central square (or a fuzzy one) to orbit around. Some referred to the “ghettoization of views”, a well known phenomenon of liked-minded people linking up and reinforcing each other’s views, that the internet has greatly enhanced (it’s so much easier to find someone who shares your views, no matter how peculiar, on the web than in your neighborhood). Indeed, some have seen in these new media interesting opportunities for exchanges with “others”, a chance to counter islamophobia or just plain ignorance, provided one gets out of his/her “ghetto” or bubble of similar views. And in fact, these media can and have become a tool for proselytizing, and some have noted that political groups such as the Muslim Brotherhood have been quick to adopt them. Also, sermons and lectures, whether orthodox or heterodox, are so much easier to disseminate through these media. The success of various efforts and strategies remains to be seen. I think all of these views have some merits and draw our attention to the importance of these media. I doubt that anyone reading these ideas (on a blog!) will strongly disagree. However, I think that we need to be careful not to give these new tools more credit or power than they actually have. After all, how many Muslims have access to the internet to begin with? According to the 2011 Global Information Technology Report that I presented last week, the percentages of internet users in the following (large) Muslim countries are: Algeria 13.5 %, Iran 11.1 %, Pakistan 11.3 %, and Egypt 24.3 % (this last figure I find surprisingly large). Moreover, the internet, and even more so the new media, require(s) a certain level of education and sophistication. And finally, there is still the language barrier, as English, although diminishing in dominance, is still the lingua franca of online exchanges. So I would accept the views expressed above and take those remarks as interesting trends to keep in mind but only with the important caveat that they only apply to highly educated and sophisticated Muslims/people. Here is a fantastic short animation that captures the heart of Istanbul (tip Al-Biruni). Somehow it seems like a good idea to post it today. Istanbul from idil ar on Vimeo. Astronomers, geologists, and biologists always struggle to convey the immensity of time and space to general audience. We are simply not used to thinking in terms of millions or billions of years. In fact, this is one of the big obstacles to understanding the long and slow process of evolution. Carl Sagan used his brilliant Cosmic Calendar (click for the YouTube clip) to bring home the immensity of time. "Then to give the kids a historical perspective, Chacko told them about the earth woman. He made them imagine that the earth - 4600 million years old - was a 46 year old woman- as old as Aleyamma teaacher, who gave them Malayalam lessons. It had taken the whole of earth woman’s life for the earth to become what it was. For the oceans to part. For the mountains to rise. The earth woman was 11 yrs old when the first single celled organisms appeared. The first animals, creatures like worms and jellyfish, appeared only when she was forty. She was over forty five - just 8 months ago - when dinosaurs roamed the earth. The whole of human civilization as we know it, began only 2 hrs ago in the earth woman’s life…"
NYT on "Lawrence of Arabia"
And here is Ebert's review as part of his Great Movies series. 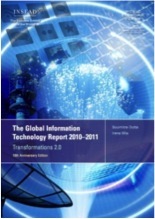 Muslim States in the "Global Information Technology Report"
The World Economic Forum recently released its 2011 Global Information Technology Report, as it has done for the past 10 years now. These reports measure the state of readiness and development of information and communication technology (ICT) in most countries of the world (138 states in the current report). In addition to tables of data, the report contains a number of chapters, which are essentially essays or case studies (including one on Saudi Arabia) by experts. These chapters include: “the promise of technology” (ICT’s impact on productivity, competitiveness, networks, and relations between governments and citizens, among others); “building communities around digital highways”; “the growing possibilities of [ICT] for reducing poverty”; etc. One of the main (relatively new) ideas in this year’s report is the emphasis on “Localisation 2.0”, which stresses the current transformation of today’s ICT world from one that has been dominated by developed countries and the English language to one where local communities, cultures, languages, customs, and laws are playing an important role in allowing ICT to benefit people everywhere. Globalization, at least in the ICT domain, is changing into a multi-cultural mindset. The data tables turn out to be extremely rich and interesting – as is most often the case with these kinds of detailed reports. The tables are real gold mines. For each country, one gets not just general indicators and an overall ICT readiness score, but no less than 71 lines of evaluation scores on various items, including: quality of educational system; quality of math and science education; internet access in schools; percentage of households with personal computer(s); etc. I’ll have to come back to these tables later. And as usual, while I do look at the whole picture, including performances by various developed countries, I like to pay closer attention to Muslim (or Muslim-majority) states. Looking at the general table of “networked readiness index for 2010-2011”, one finds the usual suspects at the top: Sweden, Singapore, Finland, Switzerland, USA, Taiwan, Denmark, Canada, Norway, and South Korea, in the top ten. The only surprise is finding Italy at the 51st place and India at 48th. Looking down the table and searching for Muslim-majority states, one finds the UAE at the 24th place, Qatar (25th), Malaysia (28th), Bahrain (30th), Saudi Arabia (33rd), Tunisia (35th), Oman (41st), Jordan (50th),, Indonesia (53rd), Turkey (71st), Egypt (74th), Kuwait (75th), Morocco (83rd), Pakistan (88th), Lebanon (95th), Iran (101st), Bangladesh (115th), Algeria (117th), Syria (124th), and Libya (126th). But of course, one cannot compare Bangladesh and Algeria or even Turkey and Egypt so simply, considering their drastically different incomes and states of development. And the report, fully aware of this, adds a column in the table to reflect that, by referring to each country according to its average income level: high income (HI), upper-middle income (UM), lower middle income (LM), and low income (LO). And with that, the performance or status of each country can be looked at more objectively, and an assessment of its progress can really be made. With that factor in mind, the high ranking of the Gulf countries is no longer impressive, since they are all “high income” (HI) states, but the relatively high positions of Malaysia and Tunisia become more striking, since Malaysia is a UM (upper-middle income) state, and Tunisia is an LM (lower middle income) state; indeed, both of these have the highest ranks in their respective UM and LM groups. Also with that consideration, the low rankings of Iran and Algeria (both UM countries) become even more worrisome. As I’ve said, there is a large amount of data and analysis in that report, and I hope to find time and occasions in the near future to come back to various sub-fields and aspects of the report. The report can be found and downloaded here. Additional material, including video presentations, can be found here. Amateur astronomy in Pakistan has been booming in the past couple of years. I have an article in the Magazine section of today's Pakistan Express Tribune that talks about this face of Pakistan. It is an understatement to say that Pakistan is going through a tough time. Scores of civilians have died, and continue to die, in spates of suicide bombings. Many of the recent terrorism suspects in the world have had links to the lawless areas between Afghanistan and Pakistan. And now, with the killing of Osama Bin Laden in Abbottabad, the world’s accusatory fingers are squarely pointed at Pakistan. But this is also a time when – of all things – amateur astronomy is blooming in Pakistan. An increasing number of young, educated Pakistanis are looking at the heavens, not necessarily to seek help, but to appreciate the grandeur of the universe. Lahore has seen its share of terrorism in recent years. More than 3,000 lives were lost in these attacks in 2009 alone. But 2009 also marked the rise of popular astronomy in the cultural capital of Pakistan. The Khwarizmi Science Society (KSS), based in Lahore, organised its first Falakayati Mela (Astronomy Festival) at Punjab University in January 2009. The Mela invited children and adults alike to look at the sky with the help of a telescope. The turnout was spectacular: over 500 people showed up to view the majestic rings of Saturn, as well as a close-up of craters on the Moon. The KSS was not content to open up the universe only to those living in big cities. They brought their telescopes to public schools in small towns in Punjab too. Just a week after the infamous attack on the Sri Lankan cricket team in Lahore, young astronomy enthusiasts from KSS had their telescopes setup at Government High School Number 1, in Phool Nagar, 50 km south of Lahore. Falakayati Melas continued through 2009 and 2010 in Okara, Jehlum, Shahdara, Swabi and Lahore. At some places 500 people showed up to look at Jupiter, at other places, 1500! While the appetite for wonder was on full display here, suicide bombings also continued throughout Pakistan during this time. Lahore, Rawalpindi, Mian Channu, Peshawar, Dera Ismail Khan. The total number of people dead in these attacks, unfortunately, outnumbers those who were looking through telescopes at these Falakayati melas. But the universe goes on. One of the architects of the Falikyati Melas is Umair Asim. A senior vice principal at a school, he has spent his lifesavings on a telescope and an observatory at the rooftop of his house in Lahore. He is one of the leading amateur astronomers in Pakistan. He recently captured a close-up of some of the Moon’s craters, and this image was picked up as the Lunar Photo of the Day (LPOD) for April 27, 2011 – the first ever from Pakistan. One of the craters in the image, Maupertius, is 44 km in diameter. The entire city of Lahore can comfortably fit in there. Umair and other astronomers from Lahore are not alone. There are a number of amateur astronomers in Karachi. They delight when power goes out in the city of lights – which seems to happen more than it should. Just this past year, Karachi Astronomy Society (KAS) organised an all-night astronomy session at Badro-Jabel – a dark site, located about 300 km from Karachi. This was an unprecedented gathering of Pakistani astronomers, with some joining in from as far as Lahore. Multiple telescopes were present; the star amongst them was an 18-inch Dobsonian telescope, perhaps the largest of its kind in Pakistan. Its owner, Khalid Marwat, has not only been generous in sharing the telescope, but also in imparting lessons about the night sky. For one night, a small part of a Pakistani desert had eyes that could see and appreciate the beauty of the Orion nebula – a gas cloud that is forming new stars. This nebula is located about 1500 light years away and is lit by the light of baby stars. It wasn’t in the Orion nebula, but our own Sun was also born in a stellar nursery such as this, a few billion years ago! For a moment, however brief, the news of terrorism seemed to fade away in this cosmic context. I have my own affinity with the bright night sky of Karachi. I was first smitten by astronomy in the early 1980’s, when Pakistan Television (PTV) aired the first episode of Carl Sagan’s Cosmos. My perspective on life and the universe was never the same. The Karachi night sky did not show many stars, but this encouraged me to imagine planets around other stars, gas clouds being consumed by hungry black holes, and strange galaxies formed “only” a few million years after the Big Bang. Pakistan, at the time, was under the dictatorship of General Zia-ul-Haq. The history of US, Pakistan, and Afghanistan was in the process of being intertwined in ways that few imagined at the time. Oblivious to the political realities, a few of us formed an astronomical society by the name of Amastropak – The Amateurs Astronomical Society of Pakistan. In the late 1980s, a few small telescopes in Karachi would regularly scan the skies and bring the rings of Saturn into focus. I left for the US and received my PhD in astronomy in August 2001. My thesis explored the causes for the triggering of star formation in galaxies millions of light years away. But closer to home, the next ten years would see a dramatic increase in terrorism in Pakistan. Even the shrines of Sufis would not be spared the carnage. But at the same time we have also seen a growing interest in astronomy in Pakistan. The cause may not be easy to explain, but evidence is there for all to see. Can we build on this interest and have a program that promises small and easy-to-use telescopes all across Pakistan? “Yes to telescopes, no to guns!” Can we make astronomy our national obsession – like cricket or mangoes? Instead of being Osama Bin Laden’s hideout, can Pakistan one day be known as the nation of stargazers, that crazy country where almost everyone has seen the rings of Saturn? Published in The Express Tribune, Sunday Magazine, June 5th, 2011. Here is a fantastic short film (10 minutes) about a handwritten Urdu newspaper, The Musalman, from Chennai in southern India. It is heartening to see this kind of love and passion for the language. I grew up on Urdu books, so I have a soft corner for such a video. But it is also fantastic to see such an emphasis on calligraphy! Tucked away in the crowded southern Indian city of Chennai, in the shadow of the Wallajah Mosque, is an unflattering building. But what happens inside the building is remarkable. Every day since 1927, a dedicated team has worked tirelessly to create a handwritten newspaper, The Musalman (in Urdu: مسلمان). Today, there’s a team of six workers who work on the newspaper daily. Four of the workers are known as katibs, writers dedicated to the ancient art of Urdu calligraphy. They have the most modest of facilities: two wall fans, three light bulbs, and one tube light in an 800-square-foot building. But watching the video, you learn how this newspaper has survived for three generations — everyone who works there is absolutely devoted to the task. In fact, they are prepared to work on The Musalman until their “last breath,” an undeniable passion. To learn more about The Musalman, read this Times of India story. It is rare to come across a film that is thoughtful, hopeful, stunningly beautiful, and touches on some of the big questions about what makes us human. Nostalgia for the Light is one such film. The documentary film is set in the Atacama desert in northern Chile - one of the driest places on the planet. The desert is one of the best places to do astronomy, and over the last four decades, astronomers from all over the world have built cutting-edge telescopes in the area. But this desert is also the location where the Chilean dictator, Augusto Pinochet, held political prisoners and then later dumped bodies of many of his opponents. Twenty-five years have passed since the end of Pinochet regime, and yet, some women are still searching for the remains of their loved ones - sometimes in the shadows of the great observatories. The movie looks at the way we use our past to answer questions about life. It is a beautiful poetic essay! Nostalgia for the Light has a small distribution. It won't be in theaters for long. If it shows up in your town, please go and see it (it will be in Boston - Brattle Theater in Cambridge - for one week starting from June 10th). We will have a special screening - one night only - at Amherst Cinema this coming Monday (June 6th) night at 7:30pm. This movie will also serve as the inaugural film in the new Science on Screen series (more details to come). I will be introducing the movie and then field Q&A after the screening. Unexpected pairings of films with experts in science, technology and medicine. Introduction and Q&A to follow with Dr. Salman Hameed of Hampshire College. For his new film master director Patricio Guzmán, famed for his political documentaries (THE BATTLE OF CHILE, THE PINOCHET CASE), travels 10,000 feet above sea level to the driest place on earth, the Atacama Desert, where atop the mountains astronomers from all over the world gather to observe the stars. The sky is so translucent that it allows them to see right to the boundaries of the universe. The Atacama is also a place where the harsh heat of the sun keeps human remains intact: those of Pre-Columbian mummies; 19th century explorers and miners; and the remains of political prisoners, “disappeared” by the Chilean army after the military coup of September, 1973. So while astronomers examine the most distant and oldest galaxies, at the foot of the mountains, women, surviving relatives of the disappeared whose bodies were dumped here, search, even after twenty-five years, for the remains of their loved ones, to reclaim their families’ histories. Melding the celestial quest of the astronomers and the earthly one of the women, NOSTALGIA FOR THE LIGHT is a gorgeous, moving, and deeply personal odyssey. 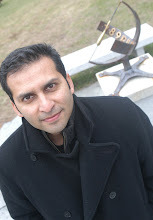 Salman Hameed is an astronomer and Assistant Professor of Integrated Science & Humanities at Hampshire College. He works on issues related to science and religion, including analyzing reconciliation efforts between astronomers and native Hawaiians over telescopes on top of sacred Mauna Kea in Hawaii. NOSTALGIA FOR THE LIGHT is a meditation on Time and Memory and how we make meaning out of history. Dr. Hameed will talk about the interaction of science, culture and politics at some of the best observatory locations in the world.